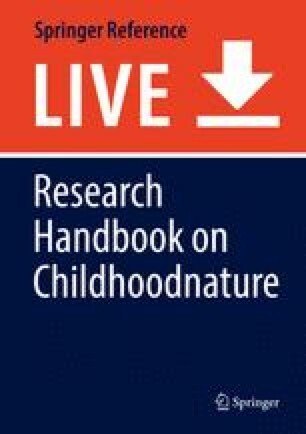 This chapter explores patterning as a transdisciplinary approach to conceptualize childhoodnature through the ways patterns of self and environment interconnect, relate, and resonate. In doing so, we aim to critique the compartmentalization of education through discipline foci, space and time limitations, and separations from nature. We argue that despite trends toward integrated and holistic approaches in education, such as STEAM (science, technology, engineering, arts, and mathematics), and inquiry-based learning, a deeper, more aesthetic and ecological approach that encompasses childhoodnature is needed. Analyzing research on patterning in the early years of education and development, it has been noted that patterning is mostly conceptualized and understood through discipline-focused lenses, such as in mathematics, science, and the arts. Putting forward the argument that innate knowledge of patterning has been eroded from our everyday lifeworlds, a holistic concept of childhoodnature is required. We contend that knowledge and learning about patterning could enable children to make complex connections with their selves and environment, as ecological and aesthetically engaged learners. Based on eco-critical perspectives and incorporating Indigenous cultural arts, this chapter reconsiders and reconceptualizes ways pedagogies and curricula in education to encompass a more transdisciplinary approach with a biophilic focus. Adams, J. L. (2012). In search of an ecology of music. Retrieved from www.johnlutheradams.com/writings/ecology.html. Barad, K. (2003). Posthumanist performativity: Toward an understanding of how matter comes to matter. Retrieved from http://humweb.ucsc.edu/feministstudies/faculty/barad/barad-posthumanist.pdf. Bateson, G. (2017). The pattern that connects: Gregory Bateson and the ecology of mind. Retrieved from: http://www.wildculture.com/article/pattern-connects-gregory-bateson-and-ecology-mind/1213. Bateson, N. (2015). What is mind? Retrieved from: https://www.youtube.com/watch?v=OmwfP5Rl6KI. Encyclopedia of Earth. (2017). The Anthropocene. Retrieved from https://editors.eol.org/eoearth/wiki/Anthropocene. Fee, D. (2013). The unfinished dome. Retrieved from http://dominicfee.info/dimensions-location-variable. Finkel, M. (2017). Into the woods: How one man survived alone in the wilderness for 27 years. Retrieved from https://www.theguardian.com/news/2017/mar/15/stranger-in-the-woods-christopher-knight-hermit-maine?CMP=fb_gu. Ghanbari, S. (2015). Learning across disciplines: A collective case study of two university programs that integrate the arts with STEM. International Journal of Education & the Arts, 16(7). http://www.ijea.org/v16n7/. Graham, W. C. (2014). Nature’s patterns: Exploring her tangled web. Retrieved from: www.patternsinnature.org/Book/blog. Haddon, A. C. (1914). Evolution of art: As illustrated by the life-histories of designs. Retrieved from https://archive.org/details/evolutioninartas00haddrich. Haraway, D. J. (2016). Staying with the trouble: Making Kin in the Chthulucene. Retrieved from http://ebookcentral.proquest.com/lib/deakin/detail.action?docID=4649739. International Association of Nature Pedagogy. (2017). About us. Retrieved from https://www.naturepedagogy.com/index.html. Kanherkar, R. R., Bhatia-Dey, N., & Csoka, A. B. (2014). Epigenetics across the human lifespan. Frontiers in Cell and Developmental Biology, 2, 49. http://doi.org/10.3389/fcell.2014.00049. Meade, A. (1999). Schema learning and its possible links to brain development. Paper presented at the Children’s Hospital of Michigan, Wayne State University, Detroit, Nov 18, Retrieved from https://eric.ed.gov/?id=ED438903. Meisner, G. (2014). Seurat and the golden ratio in art composition. Retrieved from: https://www.goldennumber.net/georges-seurat-golden-ratio-in-art/2. Sasaki, M. (2015). ‘Collected works’. Retrieved from http://www.sasakimakoto.com/portfolio.html. Tamarapa, A., & Wallace, P. (2013). Māori clothing and adornment – kākahu Māori – Ngā taonga tuku iho – traditional Māori dress. Retrieved from: http://www.TeAra.govt.nz/en/maori-clothing-and-adornment-kakahu-maori/page-1. Wallace, C. (2011). Carmel wallace. Retrieved from: http://carmelwallace.com/sculpture/carmelwallace_cocoon1-2009_50x33cm-dia-var_beach-found-fishing-ropes-cable-ties. Wertheim, C. (2015). Eidetic images. A conversation between. Alison Mark, Christine Wertheim, Raoul Bunschoten, Alejandro Zaera-Polo, Mark Goulthorpe. Retrieved from https://www.youtube.com/watch?v=WONXhyrZmmM. Wertheim, M. (2009). The beautiful math of coral. TED talk, Retrieved from https://www.ted.com/talks/margaret_wertheim_crochets_the_coral_reef. Wolesley, J. (2017). ‘Collected artworks’. Retrieved from http://www.johnwolseley.net.